TLR4 expression levels and cleavage or degradation products can vary between different cell and tissue samples. Customers have observed this variability in WB band size and our laboratory has confirmed this variability as well observing lower molecular weight cleavage and degradation products and in some samples a lack of the full length TLR4 band. The TLR4 cleavage and degradation products and potential lack of full length TLR4 are well documented in the literature, including PMID 16885150 and 22927440. We recommend running a positive control human intestine tissue lysate. Synthetic peptide corresponding to Human TLR4 aa 100-200 conjugated to Keyhole Limpet Haemocyanin (KLH). 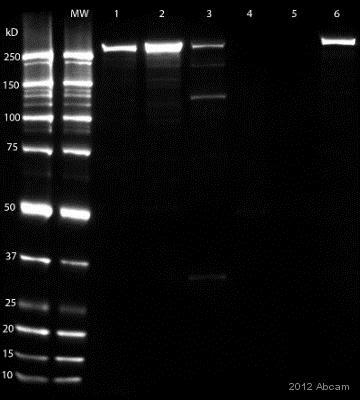 Human, Mouse and Rat small intestine for Western Blot or THP1 cells for FACS analysis. Jurkat cells. Our Abpromise guarantee covers the use of ab22048 in the following tested applications. IHC-P 1/100. Perform heat mediated antigen retrieval before commencing with IHC staining protocol. Antigen retrieval with citrate buffer pH 6. Methanol or paraformaldehyde fixed cells. 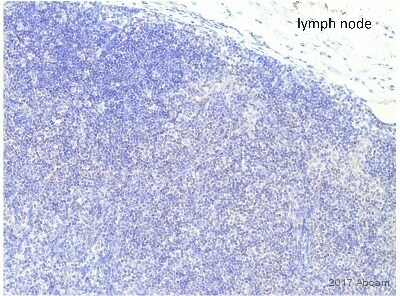 Representative examples of immunohistochemical staining of TLR4 in colorectal carcinoma tissues (original magnification 100×). Paraffin-embedded human normal colorectal tissue (A) and colorectal carcinoma tissue (D) stained for TLR4 with ab22048 in immunohistochemical analysis. Counter stained with hematoxylin. No staining is observed in normal colorectal tissue (A). ab22048 staining TLR4 in Human stomach tissue sections by Immunohistochemistry (IHC-P - formaldehyde-fixed, paraffin-embedded sections). Tissue was fixed with formaldehyde and blocked with 5% serum for 1 hour; antigen retrieval was by heat mediation in citrate buffer (10mM, pH 6) (ab64236). Samples were incubated with primary antibody (1/100) for 1 hour at 23°C. An undiluted HRP-conjugated goat anti-mouse IgG polyclonal was used as the secondary antibody. Overlay histogram showing Jurkat cells (ab7899) stained with ab22048 (red line). 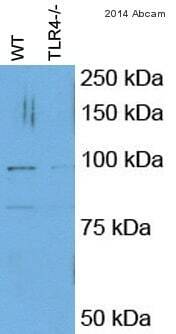 The cells were fixed with methanol (5 min) and incubated in 1x PBS / 10% normal goat serum (ab7481) / 0.3M glycine to block non-specific protein-protein interactions. The cells were then incubated with the antibody (ab22048, 1µg/1x106 cells) for 30 min at 22°C. The secondary antibody used was DyLight® 488 goat anti-mouse IgG (H+L) (ab96879) at 1/500 dilution for 30 min at 22°C. Isotype control antibody (black line) was mouse IgG2b [PLPV219] (ab91366, 2µg/1x106 cells) used under the same conditions. Acquisition of >5,000 events was performed. This antibody gave a positive signal in Jurkat cells fixed with 4% paraformaldehyde (10 min) used under the same conditions. ab22048 staining TLR4 in Mouse spleen tissue sections by Immunohistochemistry (IHC-Fr - frozen sections). Tissue was fixed with acetone and blocked with 10% serum for 30 minutes at 20°C. Samples were incubated with primary antibody (1/100 in PBS-BSA) for 1 hour at 20°C. An Alexa Fluor®488-conjugated Rat anti mouse IgG polyclonal (1/200) was used as the secondary antibody. TLR4 labelling (yellow) co-localises with CD35 labelling (red) on follicular dendritic cells in the spleen. 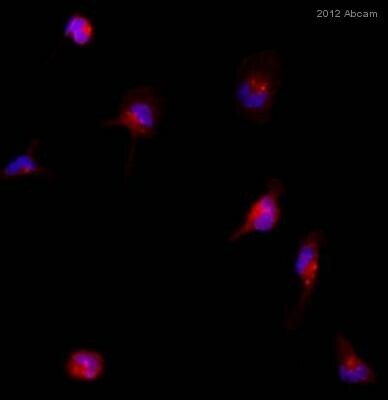 TLR 4 alone (green) can also be seen on other cell types in the spleen- most probably macrophages. 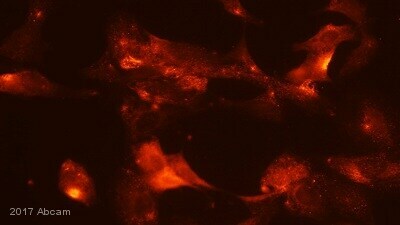 Immunofluorescence analysis of murine macrophages, staining TLR4 with ab22048. Cells were fixed with formaldehyde, permeabilized with 0.1% Triton X-100 and blocked with 1% BSA for 10 minutes at 25°C. Samples were incubated with primary antibody (1/100 in 1% BSA) for 12 hours at 4°C. A TexasRed®-conjugated donkey anti-mouse (ab6818) polyclonal IgG (1/100) was used as the secondary antibody. ab22048 (5 ug/ml) staining TLR4 in Human skin tissue sections by Immunohistochemistry (IHC-P - paraformaldehyde-fixed, paraffin-embedded sections). Membrane-cytoplasmic immunopositivity of TLR4 was primarily observed in the pigmented basel cells and the adjacent keratinocytes in the epidermal layer. ab22048 at 5 µg/ml staining TLR4 in Human colon tissue sections by Immunohistochemistry (Formalin/ PFA-fixed paraffin-embedded tissue sections). Left hand image shows staining with an isotype control antibody whilst right one shows staining with ab22048. ab22048 staining TLR4 in Rat's salivary gland tissue sections by Immunohistochemistry (IHC-P - paraformaldehyde-fixed, paraffin-embedded sections). ab22048 at a dilution of 1:100 generated a membrane-cytoplasmic staining in the tissue with stronger signal in ductal epithelial cells. 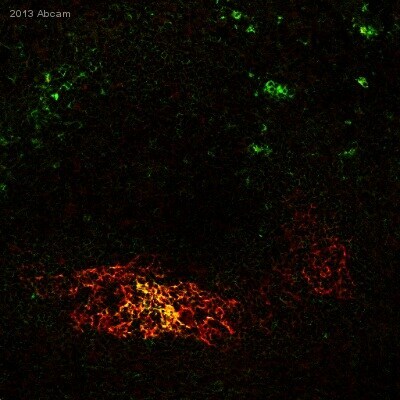 What secondary antibody was used with ab22048 for the Flow Cytometry image? The Flow Cytometry image using ab22048 was obtained with secondary antibody product ab47041: Goat polyclonal Secondary Antibody to Mouse IgG - H&L (PE), pre-adsorbed. I would like to try ab22048 for use with sheep samples, can you please suggest a suitable human or mouse positive control? Suitable positive controls include human, mouse or rat small intestine samples for WB applications, and THP1 or Jurkat cells for Flow Cytometry applications. Can you please suggest some positive controls for use in WB and IHC? For use in WB applications, small intestine whole cell lysate products from either human (ab29276) or mouse (ab79390 are suitable positive controls. For use in IHC applications, we can recommend product ab4327: Colon (Human) Normal Tissue Slides (ab4327).